We're always looking for the right people. AEI is always looking for self-motivated and talented people to join its team. We are here to connect the people sharing the same values to build aviation effective. We are small maintenance organization with headquarters located in Bratislava, Slovakia. Our business activities are not limited to secure line maintenance for Airbus A320F and Boeing B737 in Slovakia, Romania, Armenia and Moldova. The line maintenance is a core business for us. We also provide logistic support for aviation industry. Passionate and self-disciplined people interested in Working Together with us to build aviation effective. For all current positions please see section "Open vacancies" below. What do we expect from candidate? What do we propose to candidate? 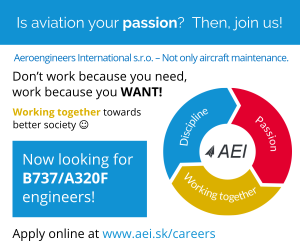 Why should you apply for a job to Aeroengineers International s.r.o. (AEI)? Please go through below questions to decide if AEI is the right company for you. Do you still not find in your career what you are looking for? Are you really passionate and disciplined to work for aviation? Do you feel that you have limited opportunity to develop yourself in field of aircraft maintenance? Do you think that your employer does not appreciate your proactive attitude to produce outstanding performance? One more reason to join us! Open vacancies - "The last five seats left!"